How can I use a flyer after picture day? Sometimes you can publish a job and still want more sales after the initial rollout. Perhaps it sold well, and you're curious to see if you can get one or two more purchases. Or, maybe you didn't think it performed as well as it could have, and want to promote it again. Post picture day flyers can help you do just that! 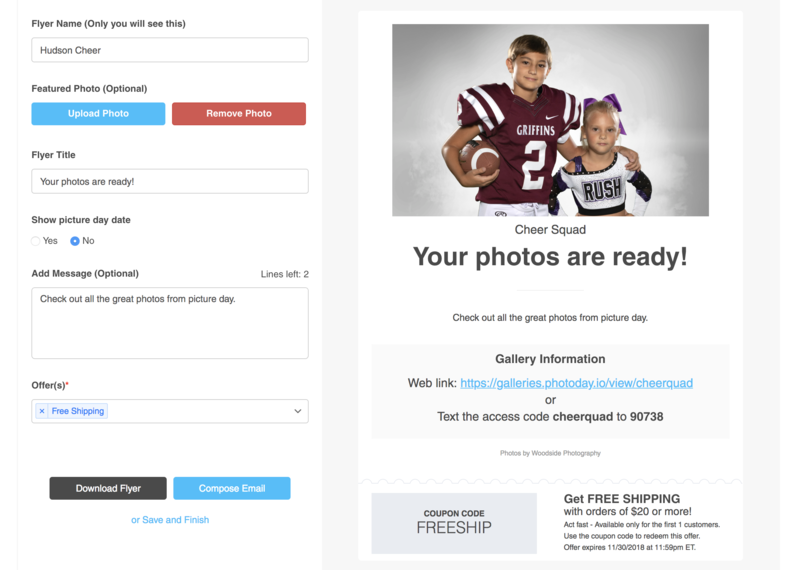 Using our Post Picture Day Flyer template can serve as a gentle reminder to organizations and parents that their photos are available to purchase. Just like the Gallery Offer Template, you can attach up to three offers to give your customers a little extra push to place an order! When you choose to create a flyer, simply choose the Gallery Offer Template, highlighted below. Then, fill out your flyer as you normally would, attaching the relevant photo and information, as well as any offers you wish to attach. Then, simply download it, or send it to your organization contacts to get your extra promotion started!